Buy online our clothing and fashion fabric Organza Primula Cobalto. Our silk organza is a gorgeous, lightweight sheer fabric with a firm and crisp hand. It is made with natural silk, leaving the sericin, a natural substance that covers the silk threads. Often used in bridal gowns as an under fabric to add body to skirt, silk organza fabric is suitable for many uses and dressmaking interpretations, from blouses to party dresses and ceremony dresses. 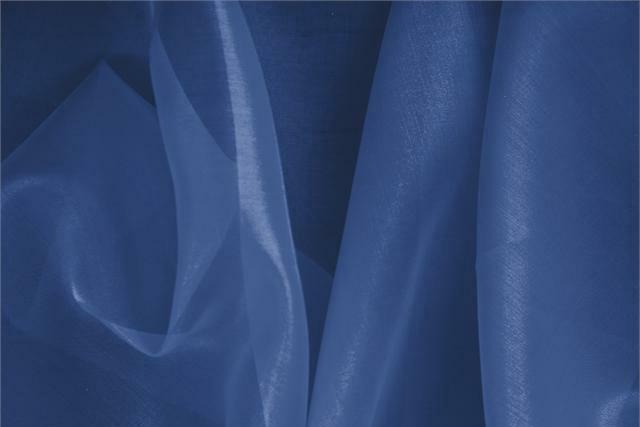 Cobalto Blue Silk Organza Plain fabric for Ceremony dress, Dress, Party dress, Shirt, Wedding dress.